This book is utterly unique, in that it manages to be humorous, literary, sinister, suspenseful, and totally wacky, all at once. I've never read anything quite like it, and I can't wait to read more of Willett's work. Amy Gallup is an aging writer whose success came too soon. She published her first book at age twenty-two, and hasn't written a word for publication or otherwise in years. Instead, she teaches a writing workshop one night a week, an extension course at the local college. An introvert who craves solitude but still feels pricks of loneliness, Amy's main company is her beloved but crotchety basset hound, Alphonse. As an introvert myself, I found Amy's compulsive desire for solitude and horror at being touched by acquaintances endearing. Her latest group of would-be writers quickly proves to be very different than past classes. At first Amy thinks she can categorize her pupils into the usual, predictable categories, but then an anonymous prankster starts wreaking havoc on everyone. A cryptic late-night phone call, an obscenity-laden critique of a short story, a pornographic sketch of an elderly female classmate, seventy-six personal pan pizzas delivered to the home of another student...and then, someone turns up dead at the bottom of a cliff. Clearly, Amy is dealing with much more than just a prankster, and she's terrified of how the perpetrator's antics might continue to escalate. The police are no help at all, citing jurisdictional issues and relegating Amy to the “hysterical old woman” category. 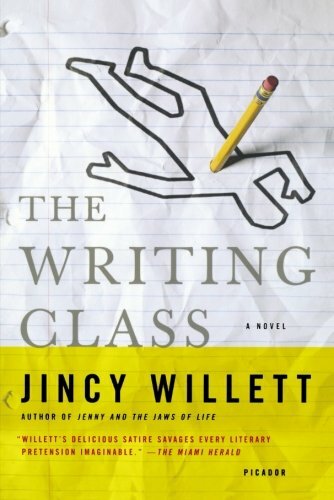 So Amy and the class decide to take the case into their own hands and find out who among them is “The Sniper,” by doing what they've done since the first week of class—analyzing the writing. Now that I've written all that plot summary, I'm pretty sure I haven't done justice to Willett's work. Yes, the premise is interesting, and the character development thorough and satisfying. What I haven't been able to capture here is the razor wit that Willett employs throughout. I couldn't believe how funny even the most macabre scenes could be, without descending into slapstick. Willett doesn't ever settle for a cheap laugh. The humor is subtle, sly, tasteful. And here I am, flapping my gums. Apparently I'm not feeling like much of a salesman today. Bottom line: Ignore my inadequate ramblings, and read this book.